The opening resource for the Open Policy #ioe12 module is a video of Cable Green, Director of Global Learning; Creative Commons, giving the keynote at ALN 2011. Cable is “interested in questioning current policy and seeing if we can do a little better”. Cable makes the argument that everyone in world can obtain the education they require but to do so we need to be open with our education through OER and sharing. He starts with the allegory of a ‘learning machine’ that we could quite easily turn on but we need to break the ‘iron triangle’ of access (the assumption that quality, exclusivity, and expense necessarily go together). During the talk he name checks all of the other open areas discussed in the Introduction to Openness in Education MOOC and talks of their importance. Cable explains that the biggest issue is that we have in the openness agenda is policy. Those that make decisions on policy do not understand the tools used (such as the Internet) and that they are only making decisions within the framework of the business models that they understand. He suggests we focus on policy because it is ‘where the money is’. Cable believes that the publicly funded resources should be open resources and we need to move towards a public policy. He goes on to highlight areas of best practice (e.g Holland and the Wikiwijs project). He concludes that only one thing really matters – efficient use of public funds. Policy makers goal is to have the highest return on investments, Creative Common’s goal is that open policy embraced by all. The talk was inspiring, but Cable’s concerns that the open community still has a long way to go ring true. OK, so back to open policy. Most of the other resources are actual open access policies such as National Institute of Health (NIH) Access Policy and the Federal Research Public Access Act and records of country and policy support of open educational resources (OER). I think it is worth mentioning here current open data policy – in the US the data.gov and in the UK open.gov.uk. At first sight the penultimate Introduction to Openness in Education #ioe12 module on Open Business Models looks like one of the drearier ones, no videos to kick off with and just a long list of papers written by John Wiley and friends. Business isn’t really my thing but I am generally interested in ‘how stuff gets paid for’, from the Internet and public services, to shops and music festivals. If ‘how it gets paid for’ make sense then it is more likely that it is sustainable and will be around for a while. I’ve tried to stop myself betting on ‘how long it will last? ?’ every time a new shop opens up in town – recession bingo? Anyway I’m sure that one of the first questions asked whenever the ‘open’ word is used is “so if it’s ‘free’ who pays for it?”. Firstly, there are many business reasons for making products (e.g. resources, courses, books, software etc.) open and freely available. Making courses available online can increase the number of students registering at an institution. OpenCourseWare programmes can be conducted in a financially self-sustaining manner. Authors can find that book sales increase when books are available as free downloads. Free access can have a positive effect on a nation’s economy through scientific progress. Online texts are often have reduced overheads. However for all these points one could also add “but it is not always the case”. “My hope was that the people who liked the free e-book would buy the sequel [which was newly available in hard copy]. According to my fan mail, people loved the free book. I know they loved it because they e-mailed to ask when the sequel would also be available for free. For readers of my non-Dilbert books, I inadvertently set the market value for my work at zero. Oops.” Rich, M. (2010, Jan. 22). With Kindle, the Best Sellers Don‘t Need to Sell. The New York Times. The key seems to be both audience and timing of release. Secondly, licences have a key role to play in ensuring that the ‘right people’ have free access to resources. For example we are a lot happier about students having free access to e-books than we are about companies taking free e-books and publishing them for commercial profit. Licences help with mixed market approaches in which companies publish free e–textbooks or resources and supporting then with commercial initiatives. Also many companies are utilising the “fermium” pricing strategy in which some goods are given away for free, while premium services are available for a price. So these points are interesting but don’t necessarily explain the business model for ‘open’. It seems to me that many companies take the loss leader or freemium approach and hope that money can be made elsewhere. Some use advertising to support products while public sector institutions receive public funding which allows them to share resources. However as Anderson, 2008 puts it in the Wired article Free! Why $0.00 is the future of business “although ‘free’ is an alluring adjective, it is not always a good business model“. There are many risks involved and those after sustainable models need to continue to think in an innovative way about approaches. Whatever the situation it is clear that the Internet has allowed people to be more open about business models and create ‘open business models’. 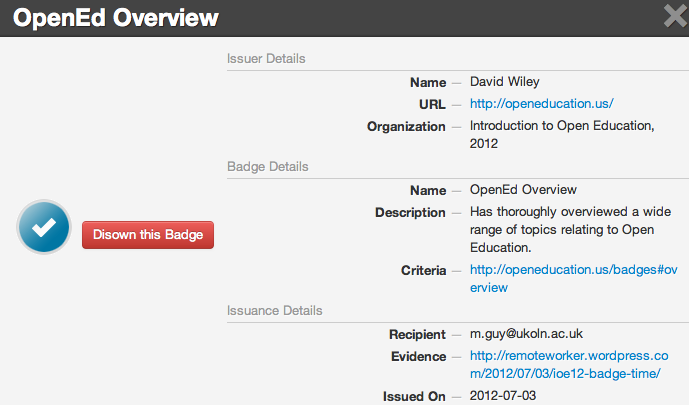 I began the #ioe12 open assessment module by watching the Badges for Lifelong Learning: An Open Conversation YouTube video. The video is a snappy introduction to the concept of open badges with endorsement for them from a number of senior educationalists/academics and CEOs. 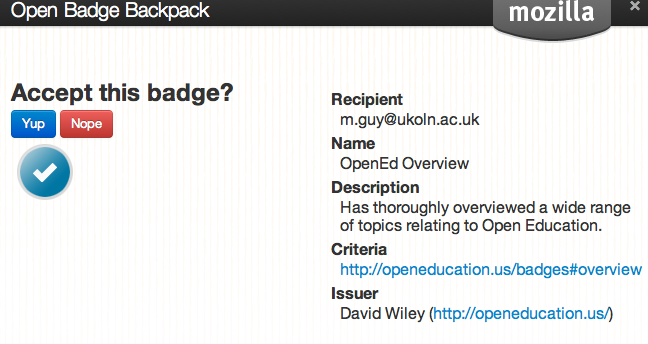 OK, sounds good…but what exactly are open badges?? And what do they have to do with open assessment? When people talk about open badges they are usually referring to the Mozilla Open Badges project. The project is making it easy for anyone to issue, earn and display badges across the web, through a shared infrastructure that’s free and open to all. Badges can be issued by anyone (educational institution, work place, online learning organisations) to anyone. These badges can then be displayed publicly on a digital (or non-digital) space (blog, Web site, Facebook, email signature, CV etc). In the Launch of HASTAC/MacArthur Foundation DML Competition 4: Badges for Lifelong Learning YouTube Mark Surman from Mozilla talks about how they are building an open badge infrastructure system. The first building block is a backpack system where users can store badges (a set of APIs for users). There is also the DML badge competition. 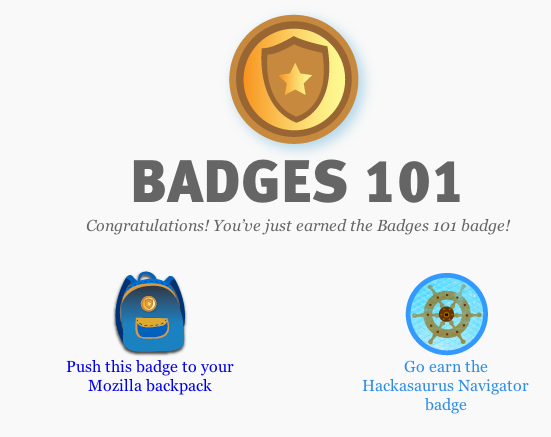 One example from the ioe12 resources is the Mozilla run School of Webcraft in which you can obtain badges. This is through the Peer 2 Peer University, a grassroots open education project that “creates a model for lifelong learning alongside traditional formal higher education”. They leverage the internet and educational materials openly available online and so enables “high-quality low-cost education opportunities“. Gamifying education with badges – The games based achievement system has it’s origins in the Xbox 360 game score system – qualifications filtered through achievements. Badges as Learning Scaffolding – Badges, as a form of scaffolded learning, reveal multiple pathways that youth may follow and make visible the paths youth eventually take. Badges to Develop Lifelong Learning Skills – By offering names for their new competencies and supporting communities. Badges as DML Driver – Badges support digital, media and learning practices. Badges to Democratize Learning – Some badges change who does the assessment and allow learners to shape the content of their badging system and perhaps even the structure itself. It’s a really interesting area, and seems to be very much ‘taking assessment to where the students are’. New and different approaches always face challenges and I didn’t feel there was enough on this in the ioe12 module. I expect some of the key problems are around validation of badges, the ease with which badges can be created and standards. Also by focusing on badges I think other ideas around open assessment (such as e-assessment, portfolios/diaries, PLEs, self-evaluation, learner created content) were sadly missed. 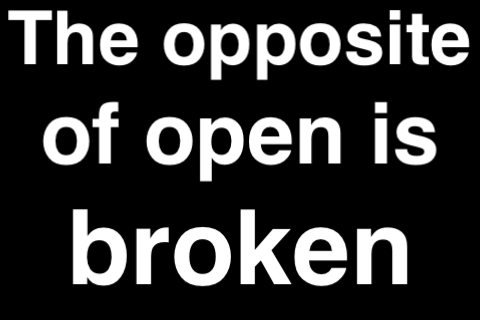 In Olympics speak … I think I’m on the home stretch now with the #ioe12 Introduction to Openness in Education MOOC. 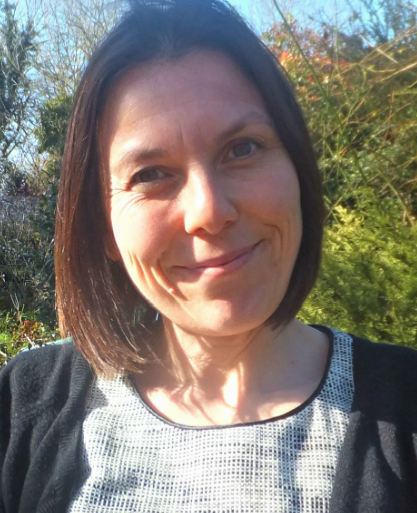 The Open Teaching module is a strange one in that it reflects on the process of open teaching (and learning) – something that I am participating in by taking part in this MOOC and writing this post. It starts out with a Keynote given by David Wiley at 2009 Penn State Symposium for Teaching and Learning with Technology. Wiley starts off with a story that highlights the challenges posed by the move to teaching and learning online (comparing water polo and horse riding polo). There are different tactics and challenges for each, caused in part by the rate of change. Wiley introduces the idea of book-ification of TV, originally coined by Lawrence Lessig, basically TV on demand. This can obviously be applied to our on campus courses – “why do I have to be in a room at 10am to hear you give that lecture” (see my recent post on flipping lectures). All this applies to education because the historic monopoly institutions have had is being challenged on almost every front. Students can now go to other places for their content: Opencourseware, Wikipedia, Public Library of Science, Arxiv.org, Google Scholar, Flat World Knowledge etc. and for their support services: ChaCha, Yahoo Answers, RateMyProfessor, email, IM, Twitter etc. and for their social life: Facebook etc. However institutions believe they are the only place students can get degrees, but what about technical credentials – MCSE, RHCE, CCNA? The keynote was given in 2009 so a little dated but Wiley sees the future as being disaggregation, while people will consider what is the value of integration (through institutions). HE needs to move away from using policy to defend tradition (as the music industry are doing) and to change. “Don’t innovate to avoid the Doomsday scenario, do it for the students”. It still seems a pertinent warning given the current climate in HE here in the UK. Do we professors, who live rather privileged lives relative to the vast majority of the planet’s population, have a moral obligation to make our teaching efforts as broadly impactful as possible, reaching out to bless the lives of as many people as we can? Especially when participatory technologies make it so inexpensive (almost free) for us to do so? Graham, Hilton, Rich, and Wiley’s paper on Using Online Technologies to Extend a Classroom to Learners at a Distance analyses the Introduction to Open Education online course (this course) originally given in 2009 through a survey conducted on students. The MOOC Guide and MOOC YouTube video introduce the idea of MOOCS (an area I’ve already covered in some detail). Fini’s The Technological Dimension of a Massive Open Online Course: The Case of the CCK08 Course Tools and the MOOC Model for Digital Practice are more in depth looks at the role MOOCs have to play in learning. Is there a role for accreditation, if any, and how it might be implemented. I’d like to reflect on these questions more after I’ve finished the course.